Scorpios make excellent doctors, surgeons, scientists and leaders. They are perfectly suited to any form of business that makes a difference in the world and greatly impacts society and people. Most importantly, Scorpio has to be in a power position. This is why these careers are suited to the Scorpio. They all demand one person in supreme control, giving orders and leading a unit of people. 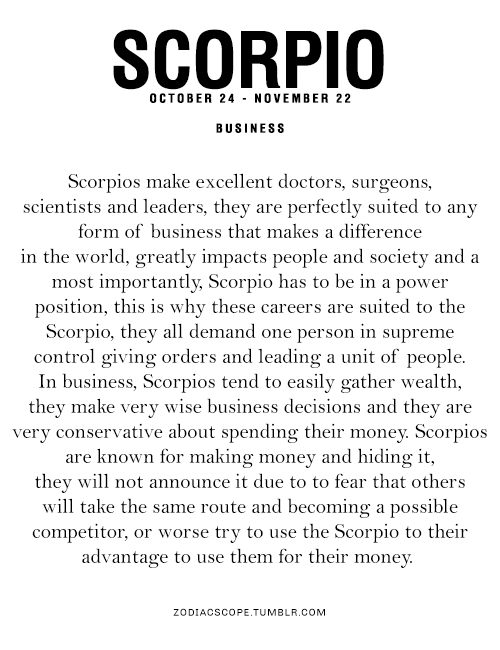 In business, Scorpios tend to easily gather wealth. They make very wise business decisions and they are very conservative about spending their money. Scorpios are known for making money and hiding it. They will not announce it due to the fear that others will take the same route and becoming a possible competitor, or worse, try to use the Scorpio to their advantage or use them for their money.